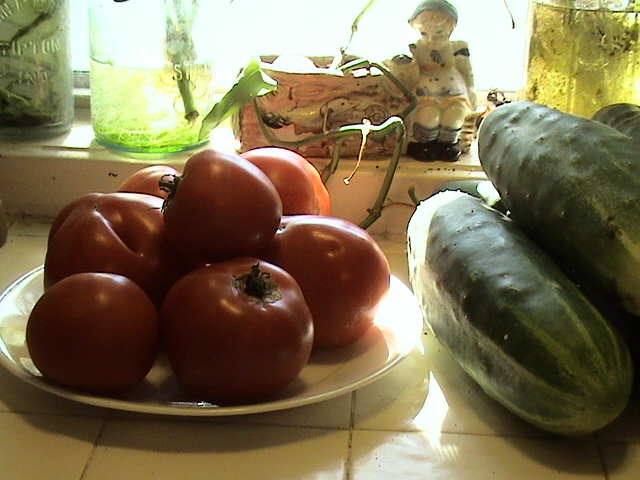 Tomatoes and cucumbers from the garden have become part of our kitchen decor. DH brags about the power of his horse manure compost as if he invented it and got a nobel prize for the invention. “George Washington swore the secret to good farming was horse manure,” says DH. We added dried manure to our compost pile of grass clippings and shredded leaves last fall. This spring DH tilled it into our garden. Then we used more grass clippings and shredded leaves for mulch on top. I was hoping the mulch would prevent unwanted plants from popping up, resulting in a no till, weedless garden. That didn’t happen. We had weeds. But, DH was so right about horse manure producing garden miracles. Our one cucumber plant has produced 60 cucumbers…so far. 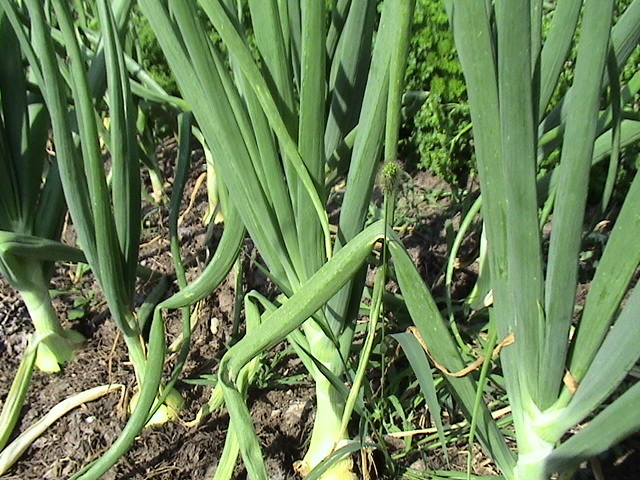 Our onions shortly before they were pulled up and cured. 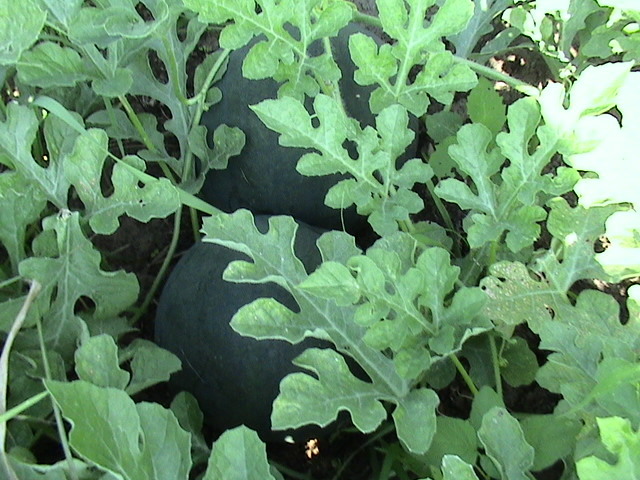 The first watermelons we found. There are at least 15 on that plant now. 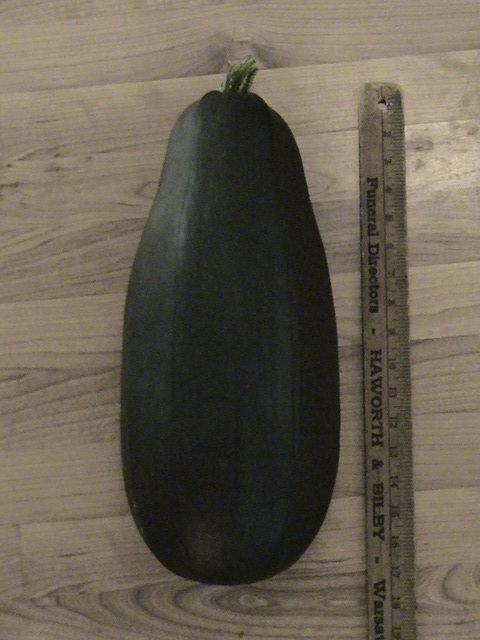 An 11 pound zuchini that came from a volunteer plant on our compost pile. We didn’t find it until it had grown to this size. 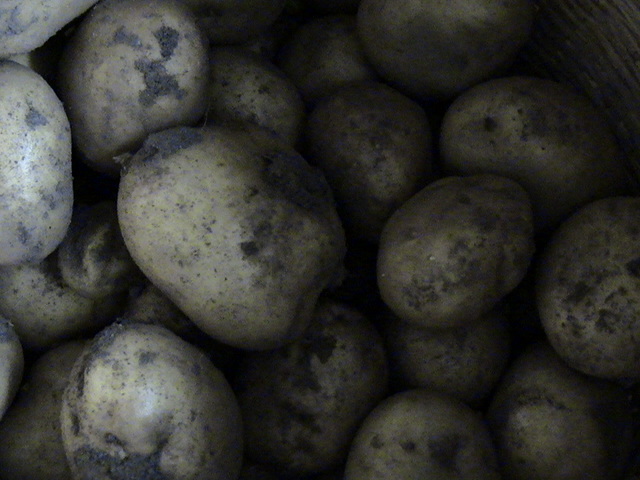 A basket full of Yukon Gold potatoes. I had no idea potatoes could be so good. 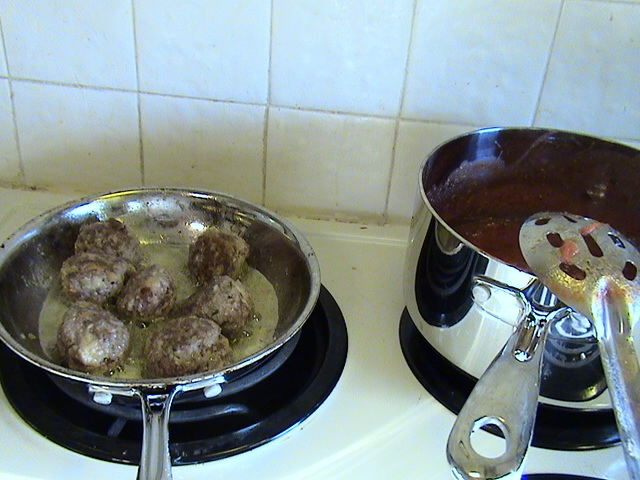 Browning the meatballs and simmering the tomato basil sauce. Dinner tonight featured home grown tomatoes and basil. Cover your frying pan and simmer on low until the meatballs for 1/2 or until the meatballs are firm and no longer pink in the middle. sauce, garlic, sugar and basil. (Other herbs may be added. I really like basil and prefer just that with tomatoes.) 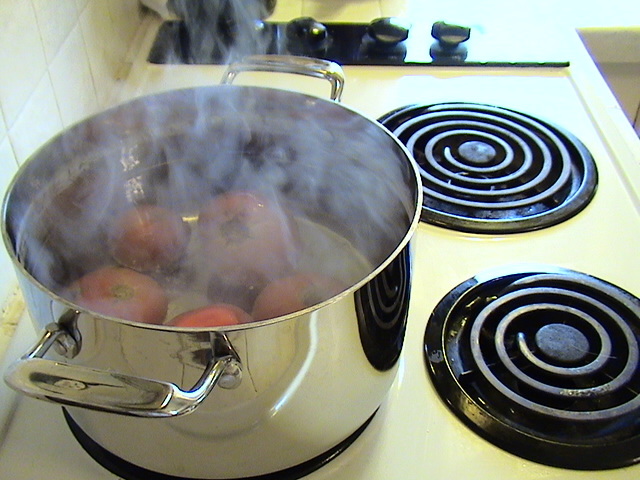 Stir all together and simmer over low heat until thickened. More sugar and a tablespoon of butter may be added if the sauce is too acidic. 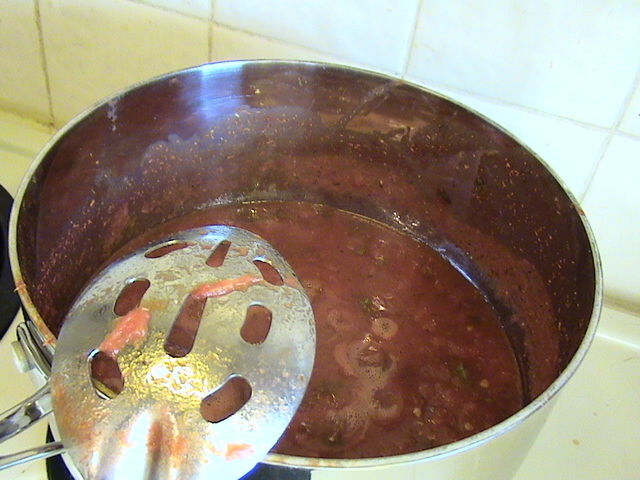 Flour (1 to 2 tablespoons) may be added if you prefer a thicker sauce. 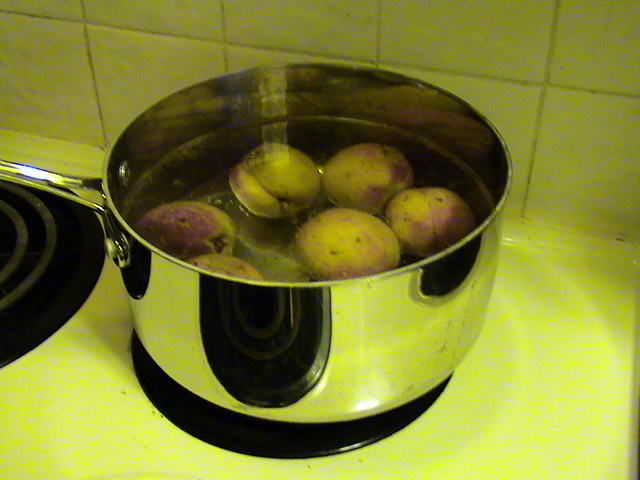 Stir frequently to prevent burning. 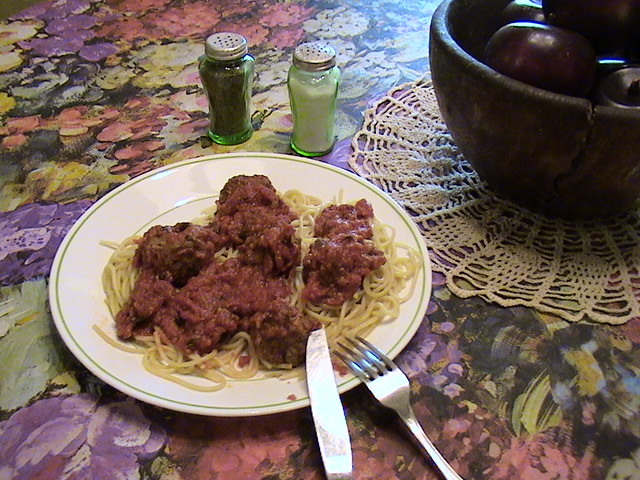 Homemade spaghetti sauce with fresh tomatoes and basil over meatballs & spaghetti. It was sooooooo good! 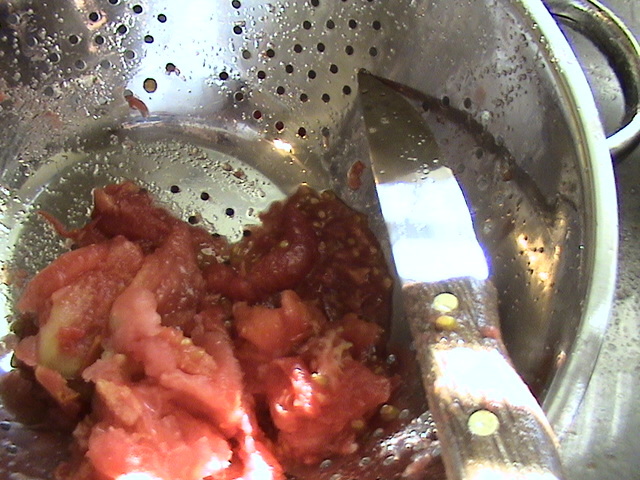 Toss the squeezed tomatoes into a colander or drainer, while you work on others. This helps more of the water to drain off. You’ll end up with a thicker spaghetti sauce in less cooking time! 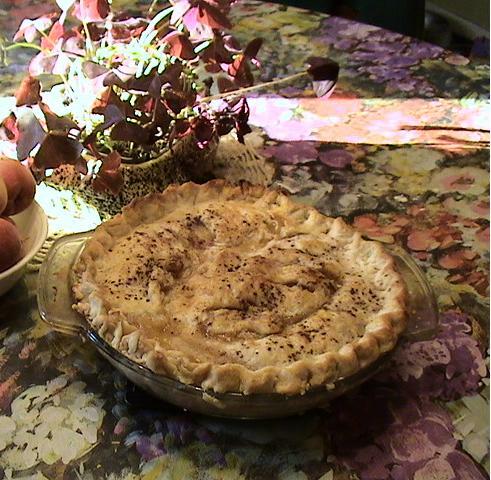 According to my husband this was the best peach pie, ever. DIRECTIONS: Bake the pie in a preheated 450 degree oven for 10 minutes. Reduce the heat to 350 degrees and bake 35 to 40 minutes or until golden brown. The middle should be bubbling. How to peel peaches: dip the fruit in boiling water for 30 to 60 seconds. 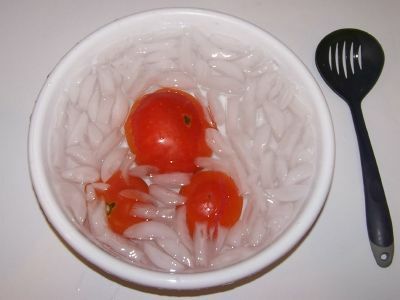 Remove from the water using a slotted spoon and put into a large bowl or pot of cold water and ice. The skins will easily slide off. Healingmagichands of http://healingmagichands.wordpress.com/, kindly added it is important to make sure the peaches are ripe before peeling. Otherwise the peels may not slip off. Thanks for your help, Healingmagichands! Peaches ripening in a sunny window. 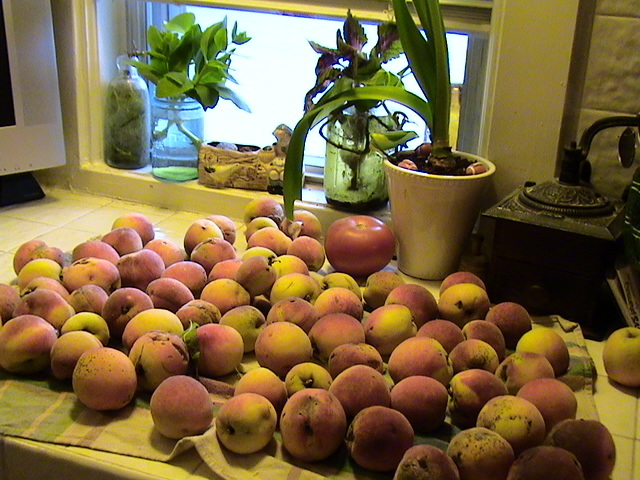 After a couple of days in a sunny window the peaches, saved from the beetles, were ripe and ready. 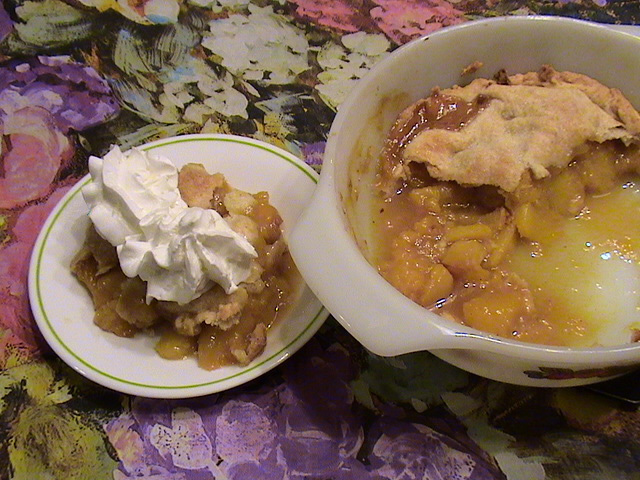 I had enough to make a peach cobbler and a peach pie, plus some for the freezer. 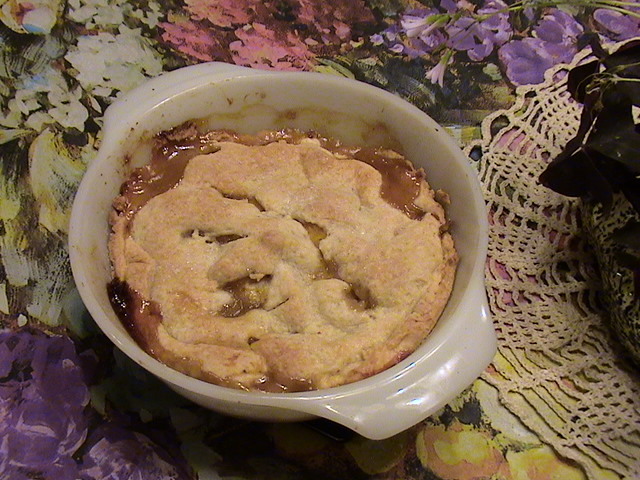 I love peach pies, crisps and cobblers, BUT with freshly ripened organic ones, this dessert is one of my favorites. Especially topped with vanilla ice cream. 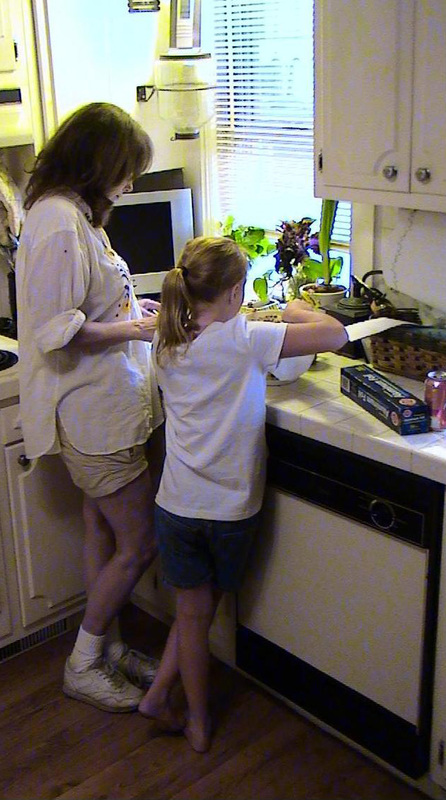 Getting ready to make peach cobbler. Grease small casserole dish with butter. Preheat oven to 375 degrees. Peel & cut up peaches. Mix peaches and lemon juice. Mix cornstarch, brown sugar and cinnamon with peaches and put peaches into greased casserole dish. In another bowl, mix flour, sugar, baking powder, salt. cinnamon and nutmeg. Cut in butter until mixture is crumbly. Add the cream and toss with flour mixture just until the dough is combined. 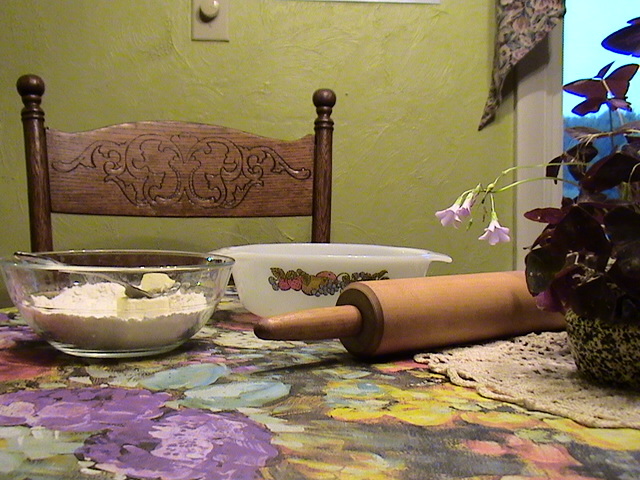 Turn the dough out onto a flour surface and knead a few times to smooth it. Then roll it out into the shape of the casserole dish. Place the dough over the filling and sprinkle with 1/4 tsp. of sugar. Bake until the top is golden and the juices are bubbling. 25 to 30 minutes. The cobbler is ready to eat. 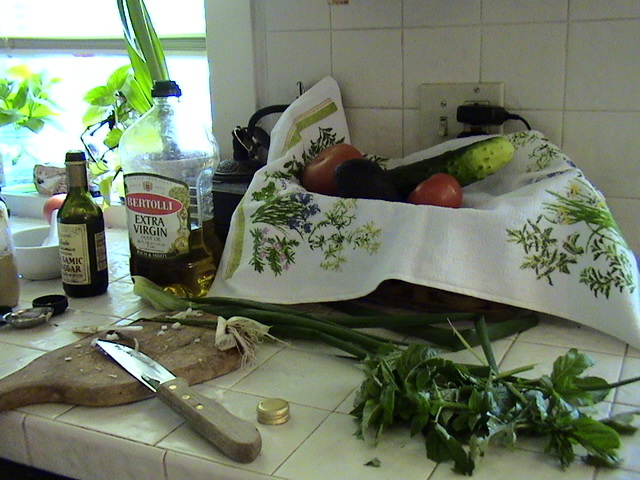 Salad preparation…the basil, onion and cucumber are from my garden. Tonight DH found a cucumber. The first of the season from our garden. I had a head of lettuce, broccoli and tomatoes from Mrs. Weaver’s vegetable stand. Plus the herbs in our garden are thriving. What better way to enjoy summer’s bounty than with a garden salad tossed in a classic French vinaigrette? Tonight’s salad was outstanding. Really. 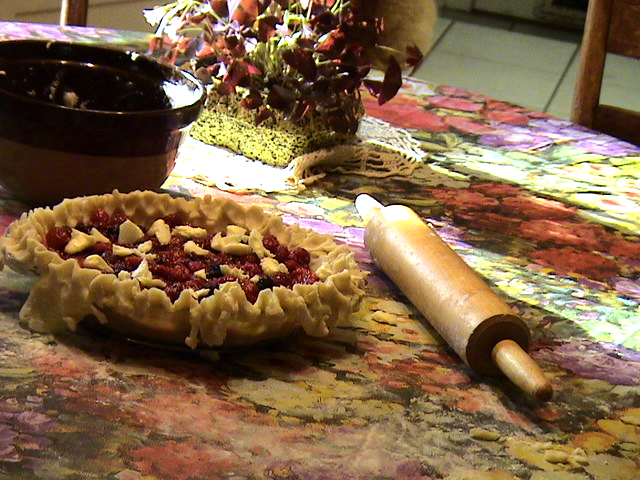 My raspberry pie is dotted with butter and ready for the top crust. It was a bit tart. The next time I make this I will add more sugar. But still, two people ate the whole pie in two days. I live in Amish country…entrepreneurial Amish country. 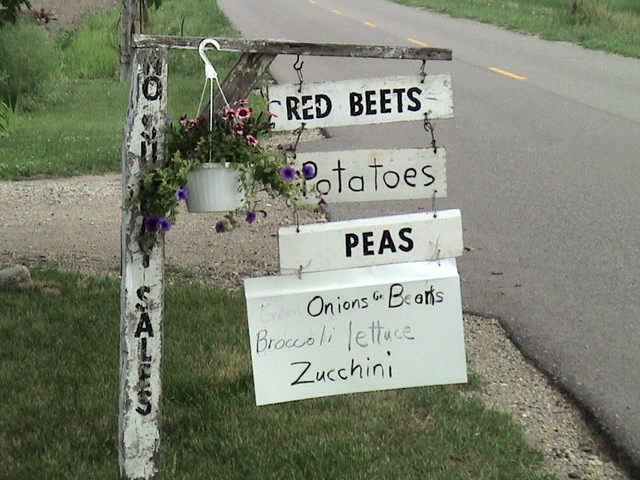 My neighbors sell eggs, vegetables, fruit, quilts, vitamins, bread, home baked food, dried noodles, handmade furniture and flowers from their homes. Saturday, Mrs. Weaver had one pint of red raspberries. I had already gathered two cups of black raspberries from the wild bushes in our woods. 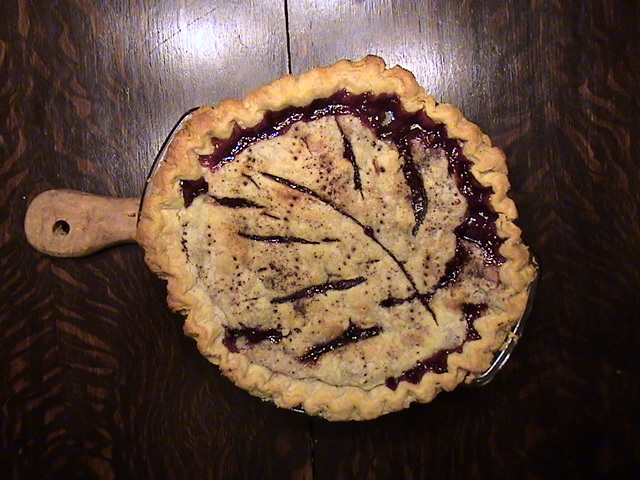 With the red raspberries from the vegetable stand I had enough berries for pie.